It’s an exciting time for folks in the Internet of Things (IoT) industry. A glut of new smart home appliances, devices, and applications are set to hit the market very soon. These products promise to transform homes, offices, and other commercial and private spaces into technological ecosystems that enable consumers to do everything from slash their electricity bill, reduce their carbon footprint, keep their family secure, and streamline their home entertainment systems. Indeed, devices like the Nest thermostat, the Ring doorbell system, and the Amazon Alexa smart assistant give us insight into the future of home appliances. Furthermore, with the advent of high-performance connectivity technologies like Wi-Fi 6 and 5G, and the promise of an additional allocation of unlicensed Wi-Fi spectrum by the United States Federal Communications Commission (FCC), the stage is set for a veritable gold rush in the IoT industry. This means there will be stiff competition for businesses developing smart home appliances, IoT devices, and related products. It also means that standing out to consumers will be difficult. Facebook advertisements are a great way to get visibility for your IoT products. Indeed, with 2.27 billion monthly active users – averaging 20-30 minutes of usage per day – Facebook is head and shoulders above its social media compatriots in terms of audience engagement. Furthermore, Facebook advertisements are a great way to leverage an increasingly mobile world. Unlike more traditional advertisement models (think: billboards, radio, television, etc. ), ads on the social media platform are not only visible no matter where your customers go, they also are significantly cheaper, reach much larger audiences, and are far more efficient. However, without the right tools, it can be difficult to implement a Facebook ad campaign that maximizes the potential of the platform. Indeed, a smart, well-designed campaign could do wonders for the visibility of your IoT device product line, and ultimately drive revenue. However, if you are unable to reach your target audience, you will be wasting money on an ad campaign that will be seen by the wrong people and fail to deliver a substantial return on investment. Furthermore, when you consider the total investment you make on an ad campaign you must factor in not only what you spend on the Facebook Ads themselves, but also the time and effort it takes to conceptualize these ads, design them, draft them, re-draft them, etc. When it comes to maximizing your return on investment for a Facebook Ads campaign, the critical step is to develop clear audience personas. This will enable you to put your advertisements in front of the people they were designed to reach. While Facebook offers unrivaled insight into their user base – everything from age and location, to their personal interests and hobbies – it can nevertheless be quite difficult to harness them. This is especially true if you run a company specializing in smart home and IoT devices. For instance, it’s not clear how useful Facebook’s geo-targeting tool will be for your company. Similarly, while data like age and gender could be useful, they could also be overly broad to the point that you are putting your advertisements in front of the wrong audiences too frequently. Finally, while an interest-based campaign might be your best bet, there is little guarantee that people are actually interested in the things they proclaim to be interested in on Facebook. To that end, while somebody might like the ecobee fan page, that does not mean they own an ecobee appliance, are in the market for similar products, or even remember liking the page in the first place. This is where Audience Finder by 42matters comes in. Because, as it turns out, you can tell a lot about people based on what they have on their phones. Indeed, you can learn so much that you can actually build an incredibly incisive audience persona by tapping into the applications that people download on their mobile devices. For instance, if somebody has downloaded apps like ADT Pulse, Vivint Smart Home, or Nest, there’s a good chance they’re interested in home security. If they’ve downloaded Google Home, Total Connect Comfort by Honeywell, and Sonos Controller, they’re probably interested in IoT products more broadly. 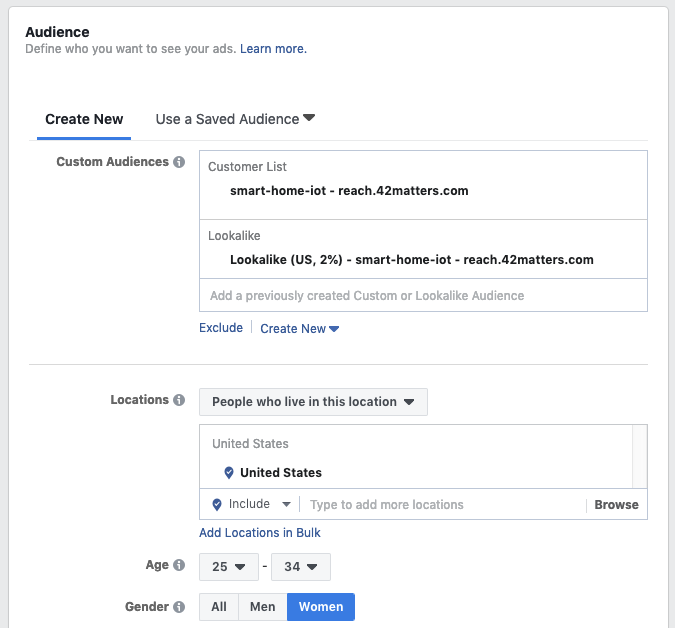 By leveraging our extensive application database, the Audience Finder by 42matters enables you to create precise audiences for Facebook advertising campaigns that are guaranteed to reach your desired consumers. Precision, precision, precision. Whether you want to build a Facebook advertisement campaign based on one application or 100, Audience Finder will have your back. With millions of mobile applications in our database, no user is out of reach and any niche can be targeted. Take aim at your competitors. It’s no secret that you and your competitors share many of the same customers. So, if your competitors have a mobile application, it stands to reason that people who have downloaded it would be interested in your product line as well. Quality is king. One of the many shortcomings of running an interest-based advertising campaign on Facebook is that people are not necessarily committed to the things they “like” on the platform. Indeed, people are far more interested in the content of the applications they have downloaded on their phones. Afterall, applications take space. So, if you don’t actually want them, you don’t download them. By building audience personas with the Audience Finder you are advertising to people that have committed to their applications. As such, they are far more likely to be swayed by your advertisements. Any device, anywhere. Facebook users access the platform on all their devices. This includes smartphones, tablets, laptops, wearables, desktops, and more. In addition, advertisements on Facebook will reach other Facebook applications like Instagram and the Messenger app. This means that a Facebook advertisement campaign, driven by the Audience Finder, will reach them no matter where they go. Step One: Define Your Audience. You probably have a pretty good idea of what your average customer is like. And presumably, you have a good idea of who your competitors are. Use this knowledge to select applications that match this profile. 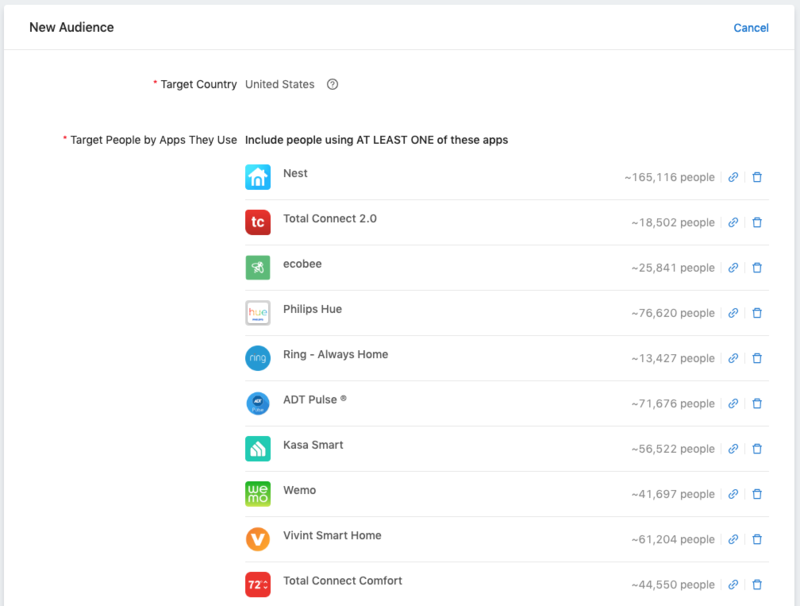 For example, if your product is a smart home appliance, you could target people that have downloaded apps like Nest, ADT Pulse, or Philips Hue, which fall broadly into the smart home category. Step Two: Export Your Custom Audience. This step is fairly self-explanatory. Once you have selected all the applications that define your audience, export the list to your Facebook Ads account. To broaden your reach, Audience Finder will automatically include a lookalike audience list. That is, one that matches the profile of the list you created. Step Three: Create Your Facebook Advertising Campaign. Once you have exported your custom audience list from the Audience Finder to your Facebook Ads account, you are ready to finish setting the parameters of your advertising campaign. To define your audience as specifically as possible, we recommend adjusting any of the standard location, demographic, and interest-based targeting options provided by Facebook. Try the Audience Finder by 42matters for Free! Big things are on the horizon for smart home devices and the Internet of Things, and the competition is only getting started. The Audience Finder by 42matters can help boost your product’s visibility by using information about downloaded mobile applications to more reliably identify your customers’ interests. This granular approach to audience targeting is guaranteed to put your advertisements directly in front of consumers no matter where they go. By using the Audience Finder in conjunction with Facebook Ads, you will be better positioned to reach your customers and drive purchases. In addition, you will be able to outflank your less tech-savvy competitors and assure that the time and money you spend on advertising is fundamentally contributing to revenue. To see how the Audience Finder can boost your marketing efforts, we are offering a 14-day free trial. Give it a shot today! Should you have any questions, we are happy to answer them. Feel free to email us at info@42matters.com. Ready to improve your ad targeting? 14-day free trial. One-click setup with Facebook Ad Accounts. Pay as you go. An example of how highly accurate audience targeting people who snore works in comparison to traditional targeting options on Facebook. Moreover, also how it can increase the specificity of your Facebook ad targeting. How to advertise your mobile game effectively on Facebook? In this article we show you numerous ways to target your perfect audience and get more installs for your mobile game with Facebook Ads. Mobiles are now an essential part of our daily lives. With apps, they also become an amazing targeting leverage. Check out the benefits of empowering this data!